Hola 6P! I’m back with another article and I’m really excited to be writing this as there is a lot to talk about! First off, Lost Thunder is finally officially out, and that means a lot of testing and prepping for Brazil! Granted a lot of my time has been dedicated to doing videos and catching the ‘hype’ wave in order to make sure I have content everywhere, but between that and coaching and my own personal games, I am very much looking forward to kicking back into full gear for Brazil now that Standard feels quite refreshed. Before Lost Thunder, we had Malamar and Buzzroc dominating, with a sprinkle of Zoroark, Rayquaza and a few other decks out there. Between the limited card pool and games which felt like whoever won the coin flip in the beginning would be heavily favored no matter what, Standard wasn’t very enticing to play. Now, however, Lost Thunder is a breath of fresh air that gives us new strategies and has at the very least added cards to the already established archetypes. There are perhaps too many potentially viable strategies out right now. Even though we do have one tournament result (from Japan) to go off of in order to try and predict the strongest cards in the metagame, that 1,200+ player tournament was played in a best of 1 format which definitely takes away a little bit of merit to a decks resilience IMO. Nevertheless, those results show some pretty cool ideas and strategies that I’ve been thoroughly enjoying playing with. The first major tournament that will have Lost Thunder legal will be the Latin America International Championship. As such, there is no defined meta, though I do believe the Japanese results will weight in majorly into many people’s testing to the event. And in turn, the LATAM IC will therefore heavily influence Roanoke the weekend afterwards. Here’s what I expect will happen at LATAM IC, along with some of the lists of my top choices that I have been personally testing and refining. First off, I’m pretty sure the good old ‘triangle’ involving Zoroark, Malamar and Buzzwole is still alive. Zoroark-GX decks get new resources such as Professor Elm’s Lecture, Counter Gain and Ditto ♢. The way the deck works essentially doesn’t change, however, the deck replaces the heavy ‘Ball card’ counts with Elm (essentially Brigette), turning a potential 10-12 spots (4 Nest Ball, 4 Ultra Ball, 2-4 Great Ball) in exchange for a solid 4 Elm and 4 Ultra Ball. And since Elm is now the preferred Supporter for turn 1, we also gain new spots as the Lillie count goes down from 4 to 1.
pokemon-paradijs.comDitto ♢ also gives the deck unprecedented flexibility in terms of establishing threats on the board, and acts as an extra copy of any basic. This led to some crazy 1 of’s in many decks, but especially Zoroark-GX decks in Japan running up to 4 different Stage 1 lines (Zoroark-GX, Lycanroc-GX, Weavile and Magcargo, all in the same deck!). The versatility this card adds to this (and almost every other) deck is incredible. Finally, Counter Gain is another asset for Zoroark which gives the deck a much needed ‘come from behind’ mechanic. Since N rotated, it feels like catching up in games is extremely difficult. However, Counter Gain allows you to threaten attacks out of the blue with a single energy drop, most notably Dangerous Rogue GX by Lycanroc for a single Fighting. This is something that should be in everyone’s minds when playing with and against any Zoroark deck. This Zoroark deck feels a lot more similar to the ones from the previous format, now that we have Elm and have a bunch of single cards that can be included. I always enjoy playing a deck like this which gives you a lot of options every turn, as that makes it less predictable by your opponent, and therefore allows for a lot of room to outplay them. The deck choose to use all 60 HP basics of course so that they can be searched for by Elm’s Lecture. The one exception being Slugma but it’s a good enough trade off. If we set up Magcargo later in the game, great, and if it’s just Trade fodder, that’s ok too. 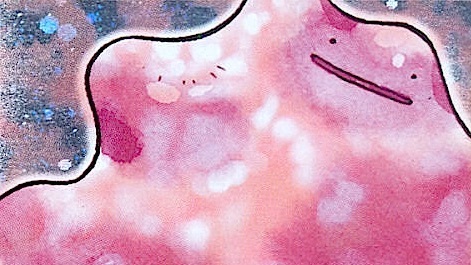 There will be some games where Ditto ♢ becomes Magcargo, others where it becomes a second Weavile, or a 3rd Lycanroc, or a 5th Zoroark. Every game will be different but Ditto’s versatility is what makes it so good. With Weavile and Lycanroc as threats, the deck has a higher fire power ceiling than before, and forces your opponent to take into account not only how many Pokémon they bench, but which ones too as Abilities in play power up Weavile. I’ve dubbed this deck ZoroDex as it feels like we have the whole PokéDex crammed in here. A continuous stream of Trades allows this deck to function, and even though it is definitely complex, there’s a familiarity to it that comes from the previous format and the turn 1 Elm’s which gives the deck a lot of stability. Next up, Malamar. This deck has been at the forefront of the format, especially since Chimecho made it seem as though the deck was able to stop everything else from setting up and dictate the pace of a game however it wanted. As I played more with and against Chimecho, I started to feel how the surprise factor was a big deal for it, and how the approach against it is usually better as slow and steady wins the game, rather than trying to immediately get rid of it. Despite that, I still won a Cup with Malamar a few weeks ago since I knew not many people would have put in the same time and effort into learning to adapt to it. Lost Thunder brings new tools to the both the GX and non-GX version of the deck. First off we have Spell Tag, a Psychic Pokémon exclusive tool card which is reminiscent of Bursting Balloon. It offers less damage counters in exchange for not getting discarded by end of turn and also being able to spread them as you seem fit. Having this choice adds skill to the card, as the right or wrong placement of the damage counters can win or lose you a game. 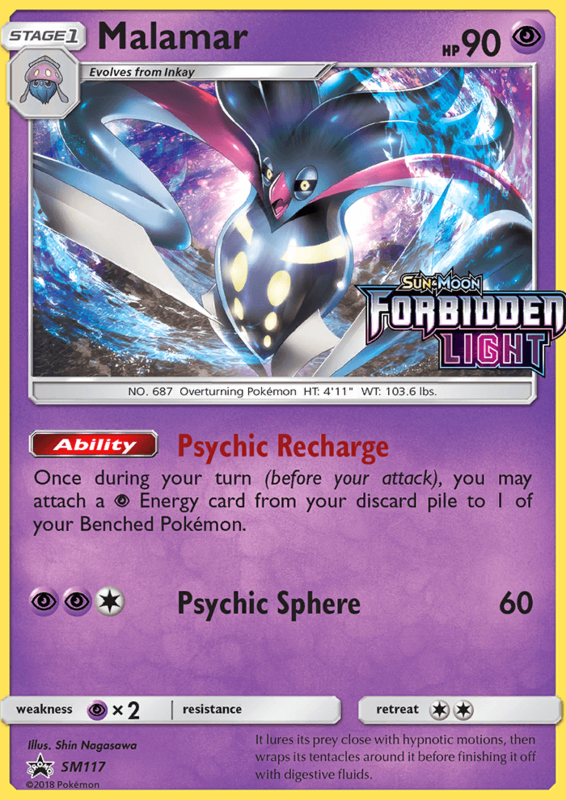 On top of that, it is another way to boost the damage output of a non-GX version of Malamar, along with Shrine of Punishment. Another new tool for Malamar is Giratina. The self included recovery Ability is great and the extra damage counter placement onto benched Pokémon is really good and has synergy with Spell Tag. Two damage counters don’t seem like a lot, but over the course of a game and combined with Spell Tags damage, it definitely starts to add up. At worst, it fixes some match where you would be a few damage counters away from scoring a KO. The extra 10 HP and 10 damage makes it a far superior choice to Deoxys, and that’s not even taking the Ability into account. Finally, we have Onix, the only non-GX fattacker that is easily splashable into Malamar and can actually OHKO Zoroark’s, the decks number 1 enemy. It doesn’t seem like a standout card when you first see it, but with DCE’s and Psychic Recharge support, 120 is a pretty cool number to hit. As was seen previously, Zoroark decks might favor versatility over covering their Weakness with Weakness Policy, meaning Zoroark’s will be wide open to be taken down by it. With all of that taken into account, I’ve settled on this list as my go to Malamar deck post-Lost Thunder, as I feel like non-GX decks are going to be performing very strongly in this upcoming format. The deck has all the new cards I mentioned before that are useful for Malamar, along with the regular consistency we can expect with maximum Mysterious Treasures, Ultra Balls and Lillie. The deck favors that engine over Elm, as Elm only searches for Inkay in this case, as opposed to Brigette which could’ve searched for other Basics like Tapu Koko, Giratina, etc. The inclusion of TV Reporter over Acro Bike is a personal one, but they could easily be switched back out. Spell Tag and Shrine of Punishment should provide the deck with enough extra firepower to be able to close out the gap between their damage output and the powerful GXs, but we still have Necrozma-GX as a kind of emergency button in case we need to score a big KO out of the blue. 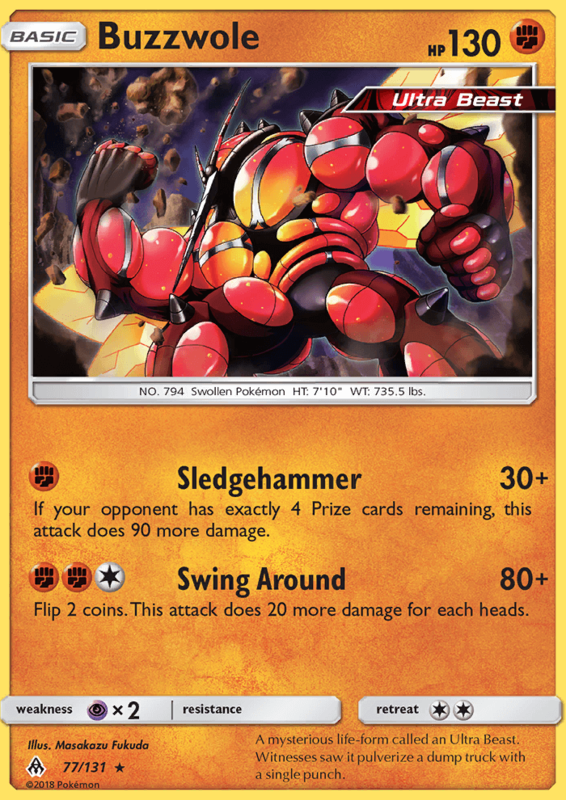 Finally we have Buzzwole as the third pillar, which is the one that gained the ‘least’ out of Lost Thunder in my opinion. Buzzroc deck is back on the rise as it gains a lot of momentum from latest Memphis and Lille results. However, with both Malamar and Zoroark strengthening themselves off of new cards, it seems like Alolan Ninetales-GX is the only new inclusion to the deck as a replacement for Magcargo. Now, I’m not sold yet on it being a direct replacement yet though. Both function in a way that grants Buzzwole more immediate access to necessary cards, more specifically multiple Beast Ring at the right time to create a checkmate scenario against opponents. Of course both can search for other cards, but that’s the main reason they are there. Having Magcargo means you are not limited to just Item cards and therefore can search for the card you need, when you need it, but only combined with Professor Kukui, Lillie, Acro Bike or Instruct from Oranguru to have access to it. On the other hand, Alolan Ninetales puts them immediately into the hand, but can’t search for anything other than Item cards. Finally, we have another advantage to playing Ninetales and that is Alolan Vulpix being Water type and therefore searchable through Brooklet Hill. With this in mind, I’ve settled on this on the last few days of testing as my go to Buzzroc list, but it’s the one I’m least convinced in terms of the changes being effective enough. The deck plays out just the same as before, as the attackers and their purpose did not change. The deck however does gain a new attacker in Alolan Ninetales-GX which has synergy with Buzzwole’s Jet Punch and in the mirror matches, the GX attack can be as menacing as a Dangerous Rogue from Lycanroc, along with being a welcome addition to counteract the Blacephalon-GX threat that is now present after Lost Thunder. Counter Gain is another new inclusion to the deck as it helps both Ninetales and Lycanroc execute their GX attack for a single energy, which can be a really good way to make a comeback in any given game. Counter Gain is also searchable by Ninetales, meaning you can definitely count on it when you needed it if you plan accordingly with your Vulpix on the bench. So far in the article we have covered the ever present triangle of decks in our current format. Lost Thunder however, definitely brings more decks into the fray, which include but are not limited to Decidueye-GX, Blacephalon-GX/Naganadel, Alolan Exeggutor, Granbull and Lost March, as the main contenders for me. Blacephalon-GX/Naganadel is the one that is hyped the most, as can be seen by the prices of said cards. However, it’s the non-GXs that interest me the most, as I feel like they can definitely compete and stand up to the GX giants, whilst having the non-GX advantage in their favor. Decidueye-GX is a card that is also gaining traction and hype, as paired with Alolan Ninetales-GX, finding Rare Candy is no longer a chore, meaning evolving into Decidueye now becomes extremely easy and therefore as games go on, the damage being placed by Decidueye ends up creating a big advantage for you. Either combined with Swampert or Zoroark-GX, Decidueye-GX might be well poised to become a force to be reckoned with in our format once again. However, I’ve had my fair share of success but also lack of with Decidueye-GX and am not focusing on it too much for the moment. Since I am going to Brazil and not Roanoke, I’m hoping to be one of the trend setters by achieving a good enough results there, and not only earn more CP towards my Worlds Day 2 invite, but also solidify my place for a stipend for the next International in Australia. As always, if you have any questions, feel free to comment on the article or contact me on any of the Tablemon social media sites. Thank you once again so much for reading, and wish me luck in Sao Paulo!